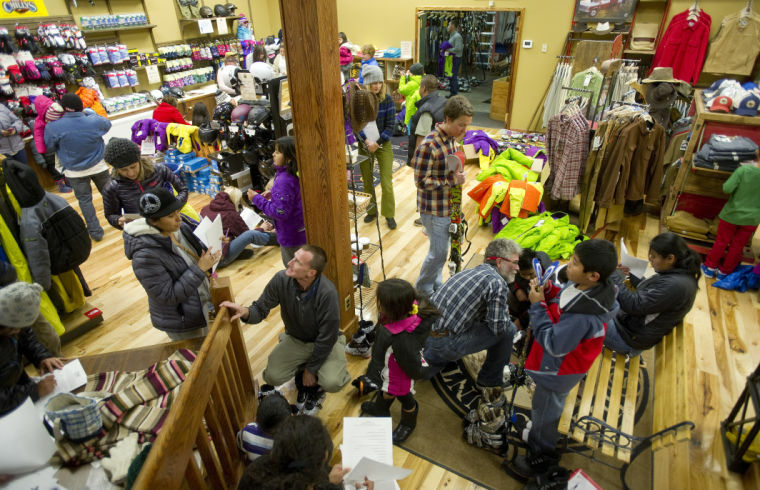 Eager young skiers gathered Dec. 4 at High Country Outfitters to get fitted with skis and boots as the Doug Coombs Foundation kicked off its second year of offering an alpine program for underprivileged kids. Last year the foundation, which honors the late ski mountaineer Doug Coombs, provided 28 children who couldn’t afford to buy gear with skis, boots, lessons and lift tickets. Most of the 28 returned to the program this year and were excited to pick up their new equipment. The kids at High Country Outfitters were kindergartners and first-graders. Eventually the foundation’s leaders hope the program will go through the eighth grade. Those kids who were part of the program’s inaugural season of 2012-13 were easy to pick out. They hurried through the East Broadway shop grabbing their new Marmot jackets from a cardboard box that they assumed, correctly, was for them. Store employees were bum-rushed by the young skiers who were hankering to get fitted for the upcoming season. Both the kids and their parents said they were grateful for the program. Parent after parent thanked foundation founder Emily Coombs for spending her time and money to introduce their children to the sport of skiing. Coombs started the foundation in honor of her late husband in 2012 and funded the first year of the 12-week alpine ski program herself. She said she worked vigorously to get the program on its feet that first year. She paid for all the lessons herself, while sponsors K2 and Marmot helped with gear. Coombs’ efforts have been rewarded in 2013 as the ski program has risen from obscurity. She no longer has to fund the program from her own pockets because of donations from the community. And a recent grant from an anonymous family foundation will allow Coombs to take the program to new heights. Thirty more children will be added in January. The additional participants have not yet been selected but will take part in the same 12-week program with the skiers from 2012-13. Coombs said that everyone in Jackson deserves a chance to ski. She said she looks forward to watching the new children learn and tracking the improvement of the original 28. She said that this is what her husband would have wanted. Doug Coombs died in a ski accident in 2006 in France. Emily Coombs said that teaching dozens of children her late husband’s favorite sport is the perfect way to honor him. Coombs said she is thrilled about the program doubling in size for 2013-14. She hopes even more children will be enrolled in the future as funds become available.